! The Haiku Challenge 2012 ~ Winners & Highlights ! PS: ! THIS EVENT REPEATS EVERY YEAR AND I HOPE TO SEE THE SAME SUPPORT EVERY YEAR ! The Haiku Challenge is a Haiku writing challenge that runs in the month of February every year. Write a Haiku or set of Haiku every day and share them in the linky tool to enjoy the words. As February being the month of love, I decided myself to express my love for Haiku, after penning down close to one hundred Haiku the love for it has become immeasurable and that made me throw a Challenge to myself, ‘The Haiku Challenge!’ in 2011. The Haiku challenge began it’s journey in February 2011, a sweet journey and aw, my sweet child is aging two now. I consider the journey as a sweet achievement as it helped to discover talents, and helped me to find some pearls. To know about the first edition of Haiku Challenge, Winners and to read participation entries stop by here. To read the kickoff post, and prompts given in this edition stop here. To read the participation entries stop here. I thought it was my dream when reading you but now I realize that it happened in real while drafting this. It was fun, 29 days of fun with Haiku, exploration of different signatures of Haiku (Haiga, Acrostic Haiku, Pi-Ku, Naisaiku and Haibun). I hope you enjoyed writing for the challenge as much as I did when hosting the challenge, if not then I should call it as Failure of Haiku Challenge and not Success! In this edition, 45 of you registered for the challenge, 54 challenged, 22 of you completed the challenging challenge colourfully and made this challenge a grand success! Three Cheers to all!!! Thank you! I love numbers and I’ve been known to cherish stats a lot. In this edition, we had 29 days, 28 challenging themes, 7 different forms, and the poets kick started the challenge expressing their love for words. In all, we read 54 poets, 1001 entries ~ (1706 Haiku); that’s an average of 35 entries (59 Haiku) each day. The minimum entry was 29 entries on Day 25, 26 & 27 and the maximum entry was 41 entries on Day 1, 2 and 9. Considering the count of Haiku, the least was 34 on Day 7 and the maximum entry was 108 on Day 23. I must thank everyone for adding smile to my heart! 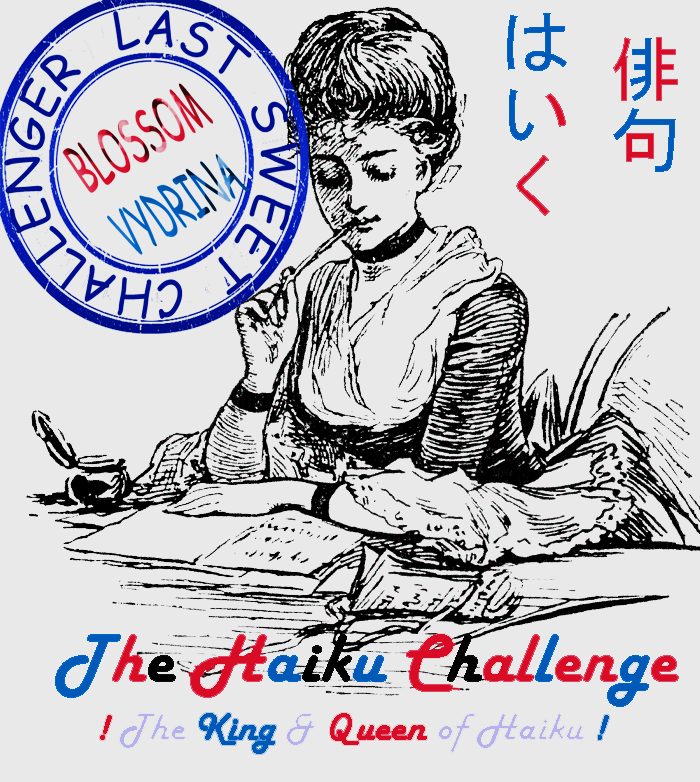 Now, it is my turn to return the favours by crowning ‘KING OF HAIKU’, ‘QUEEN OF HAIKU’, ‘STAR NEWBIE OF THE CHALLENGE’, ‘CHEERFUL CHALLENGER’, ‘FAVOURITE CHALLENGER’, ‘FIRST SWEET CHALLENGER’ and ‘LAST SWEET CHALLENGER’. Thanks for making my job easier with your precious votes. Here we go…. None other than a person who dominated others right from the start. She is a true winner as she has won hearts with her encouraging words. As I say, ‘I personally feel that appreciation is the best food for a blogger hunger, in that perspective I thank you for feeding me. I also feel critics will help a human being touch heights. So be my best critic’, she did the best, give a big hand of becca givens who garnered 80% of the votes. He came in first, he signed up first on 9 days out of 29 days defeating Ramesh Sood (7) and Pranali Kadam (5) to win the Title. Let’s give a big hand to Leo, Our Haiku Master…. It is easy to write a day but it is difficult to write continuously for 29 days with seamless flow. They did it with pride! Here you go (in alphabetical order)…! If I had missed any of your name in the completed list then I’m sorry, please drop me a mail to create a badge. If you have participated in the challenge then here you go, enjoy the badge..
+/- – Proud to be a Haiku Challenger……….. ! Check out the first ever magazine of Haiku Challenge….! Poets Featured, Winners and Highlights! 188 pages of fun! Enjoy the words! If you have any issues in viewing the magazine or downloading the magazine then please drop me a mail or leave a comment… I shall help you to enjoy the magazine..! OR Download it here ************************************************************** PS: I’ve dedicated a post, “my life… her shadow…” to my sweet mother as she taught what life is. Do stop by to know about my life.! ************************************************************** Thanks for all the sweethearts who made my month. Hoping to meet you again soon! Do Leave your footprints ! ! Share the post on Facebook, tweet, and plus your love. Shout a word to the world to enjoy the words ! Stay in touch! You can Follow me at Facebook, Twitter, Google+ or Subscribe Me!
! The Haiku Challenge 2012 – 29 days – 29 Haiku – Day 29 ! Suddenly I am feeling bad because the haiku challenge has come to an end, which means I’ve to wait for one more year to see you people write for my prompt, that’s sad and I am going to miss my HAIKU family members terribly, oh God please do not do this to me. I wish to host the challenge that can last long for 365 days but I cannot do it in my early twenties, maybe I can do it in my late forties, and if I do that, I wish to see you people participating. This journey has been a great learning experience because I have tried different forms with great people in the world of haiku poetry and I am very happy to do that. Thanks for blessing me such sweet opportunities, ie., to read you, smiles. KINDLY VERIFY YOUR LINKS HERE PS: MANDATORY! Please verify your links here and leave a comment if any of the links are missing. I also offer people to write for those days, which they missed due to some personal or technical issues. Here is the chance to catch up with other challengers and to complete the challenge. Write individual posts for those days you failed or missed to write (1 to 5) and leave the links as comments mentioning the day number. (Ex: YOUR NAME – DAY NUMBER) (Sample – Someone is Special ~ Day 10) PS: THE MINIMUM CATCH UP CAN BE ONE AND THE MAXIMUM CAN BE FIVE. If you have not voted still then please vote here because the voting ends by MARCH 1st 23:39. Any votes after that will not be considered while counting. If you have voted already, thanks! Also, I promise to release the results by March 10 or 11 with surprises, so BE READY TO BE SURPRISED! PS: Please do not forget to include the Day 29 code provided here. Happy Haiku Challenge to you all! The Game is oN…!!!!!!!!! If you have any doubts or concerns do leave a comment or just ‘Contact Me‘.
! Your simple words can help me a lot! Leave your footprints !
! Share the post on Facebook, tweet, and plus your love. Shout a word to the world to enjoy the words !
! 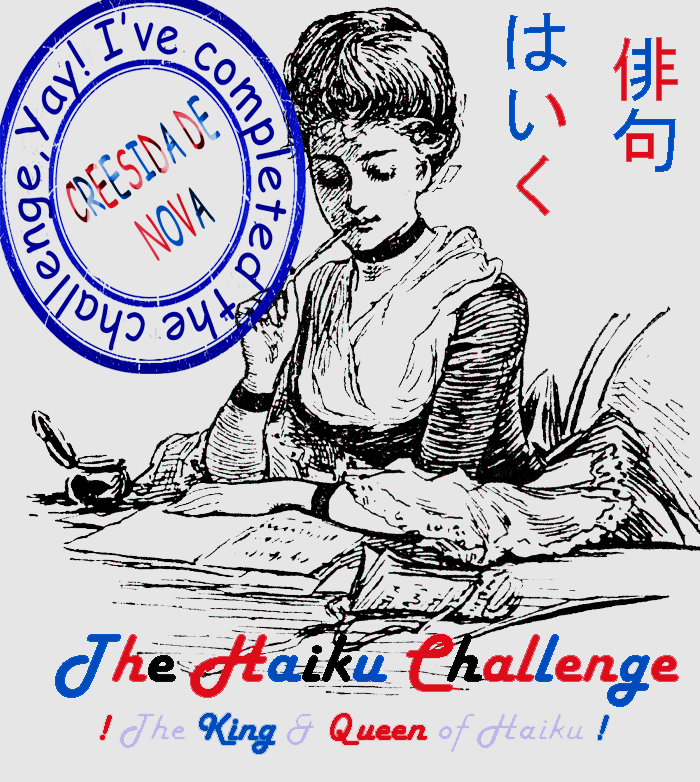 The Haiku Challenge 2012 – 29 days – 29 Haiku – Day 28 ! Most of them being close to life! Always love to be Special! PS: Please do not forget to include the Day 28 code provided here.